The 81st FIG Congress opened on Tuesday October 18 and members from 117 federations assembled at the Hilton Tokyo Odaiba Hotel. 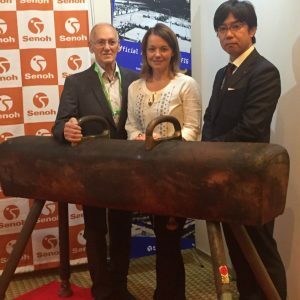 Senoh booth displayed the vintage pommel horse of 1964 Tokyo Games and welcomed federation members and executives of sports industry. On Wednesday, Mr. Miroslav Cerar, Slovenia’s gold medalist of pommel horse event at the 1964 and 1968 Summer Games, also visited our booth and enjoyed the reunion with his horse in Tokyo again after half century.